You don't have to leave Ipswich far behind to reach the most profoundly rural of the villages of the Shotley Peninsula, and this may come as a surprise, because Freston Tower, of which more in a moment, is a well-known structure, and the Boot, the village pub, is a familiar sight on the main Shotley road along the north of the Peninsula. The main village street runs off beside it. But this soon becomes a narrow, winding lane, rising and dipping between high hedges, before reaching the surprise of this church, and then beyond it a pretty, largely 19th century settlement. Freston's is perhaps the most harmonious of the three neighbouring churches in this part of the Shotley peninsula. Woolverstone may have the finer setting, and Wherstead the grandest aspect and most dramatic view. But Freston's secretive graveyard is a pleasing, peaceful place. As with its two neighbours, this church was almost entirely rebuilt by the Victorians, but in a rather jaunty style, including an Arts-and-Crafts-ish octagonal vestry on the north side with a little chimney above it. On the south side is the surprise of the flamboyant wooden life-size figure of Peace, holding her laurel wreath high, and surmounting the parish war memorial. She looks for all the world as if she is on holiday here from the main square of a small French market town. Not far off, the life-size figure of a little boy, wearing a dress in the Edwardian manner, rests smilingly beside a cross on a grave. He is little Humphrey Jervis-White-Jervis of Freston Hall, a member of a family with a rather unusual triple-barreled surname, who died at the age of 4 in 1900. He had a younger sister who was born the same year that he died. Her memorial is three along from his, but very modern; incredibly, she did not die until the mid-1990s. St Peter was a ruined shell by the 19th century. One imagines the storms blowing in up the Orwell each successive winter, gradually smoothing and reducing its ragged flintwork, until nothing would remain. However, the Anglican revival prompted by the Oxford Movement saw its restoration in 1875 by the local architect R.T. Orr. He sensitively rescued the 15th century tower, as well as several windows, including the 14th century east window. You can see Orr's plans on display inside, beneath the tower. The medieval font survives, but that's about all. Given that the rest of the interior is entirely Victorian, it is beautifully atmospheric, with that haunting feeling you get of the people who worshipped here when it was renewed now being just out of reach. They have left their memorials behind, and the best is a figure of St Christopher by the William Morris workshop. A curious survival of the past is the enamelled sign explaining the significance of Good Friday, which was propped up beneath the tower. When I first came here ten years ago, I found the church locked without a keyholder notice, but there is a warm invitation to get the key now - in fact, there are two. 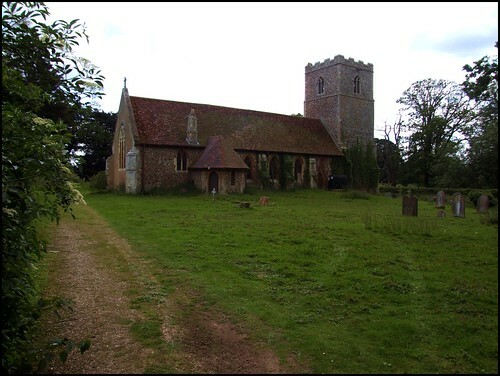 Something similar has happened at Wherstead St Mary, a mile or so off, a church with which St Peter shares many similarities. Before leaving Freston though, it is worth mentioning that, rather unusually for a sleepy Suffolk village, there are two buildings here that are taller than the church. Firstly, of course, there is the massive water tower down on the Shotley Road. But, beyond that, and more interestingly, there is Freston Tower, in the grounds of Freston Hall. This early 16th century building is six storeys high, and the tale goes that it was built as a school for the daughter of Lord de Freston. She was taught one lesson on each floor, reaching the top in the evening, before descending to the ground to begin a new day. Actually, it was probably built as a lookout tower, with a view of the estuary mouth. But it's a good story, and you can believe it if you like. There is, in any case, a splendid view of the tower from Bridge Wood on the far bank of the Orwell. The river here seems to separate two quite different Suffolks, and the secretive Shotley Peninsula feels a place apart, which in a sense it is.